Essequibo was at first governed from Fort Kyk Ovel Al but this was replaced by a new fort on Vlaggen Island in the mouth of the river. Laurens Storm van ‘s Gravesande arrived in Essequibo in 1738, became Governor in 1742 and rebuilt the fort on Vlaggen Island in 1744, naming it Zeelandia. With this protection, van 's Gravesande both encouraged established Dutch planters to relocate from upriver and opened the colony to British planters from the West Indies. The map below shows some of the plantations subsequently established on the banks of the river and the islands. 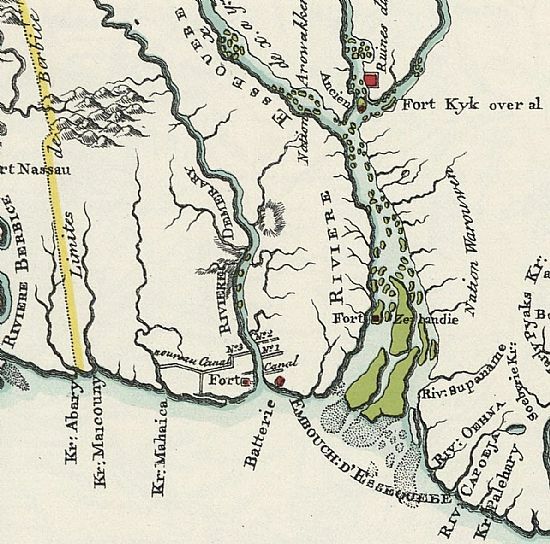 These include estates belonging to William Croydon and Ferguson (Wakenaam Island); Richard Bass Daly, Downing, Thomas and Clements (on the east shore of the estuary, at the bottom of the map); and Ferguson, Forbes and Jones (on the west shore, at the top of the map). The Colony of Demerara was established from Essequibo and grew in importance as the fertility of the soils of Essequibo became depleted.